Interested in taking your research knowledge and skills to the next level? Become an OUR Research Ambassador! 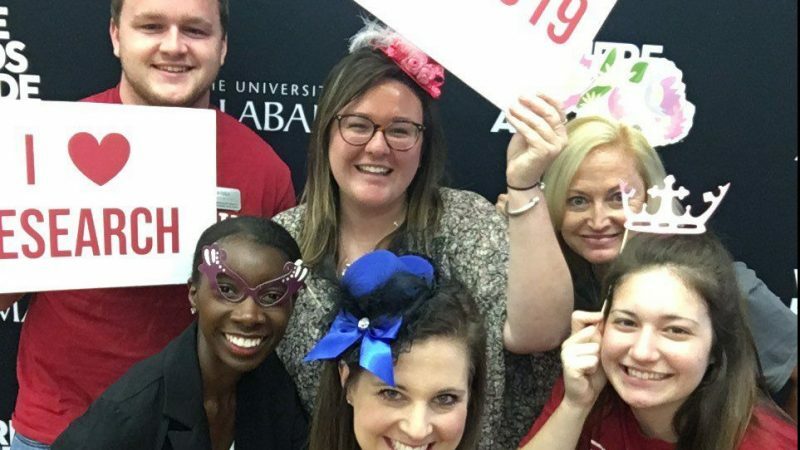 Applications are available to join this team of esteemed student researchers at the University of Alabama. Check out the requirements, obligations and opportunities below, and reach out to our Program Director Jackie Harrison with any questions. ∗ Be in and maintain good academic standing with a current GPA of at least 3.5 on cumulative coursework. ∗ Must be able to positively represent The University of Alabama and demonstrate a strong level of commitment to programs and initiatives within the office and UA through student participation and leadership. ∗ Must be actively conducting research with UA faculty member or research scientist. ∗ Must be able to commit to a one year term based on the academic calendar (Fall-Spring). ∗ Ambassadors must attend bi-weekly meetings on Wednesday at 5pm (this changes per semester to fit with the most Ambassadors’ schedules). ∗ Must hold 2 hours of office hours in 124 Burke West during each semester on set schedule. ∗ Be available to mentor students looking to get more involved in undergraduate research. ∗ Assist in developing new workshops and informational sessions that would assist students interested in undergraduate research. ∗ Assist in publicizing undergraduate research via social media. ∗ Be available to work with the respective Colleges on specific recruitment activities such as Bama Bound, University Days, Transfer Day, Undergraduate Research and Creative Activities Conference, etc. 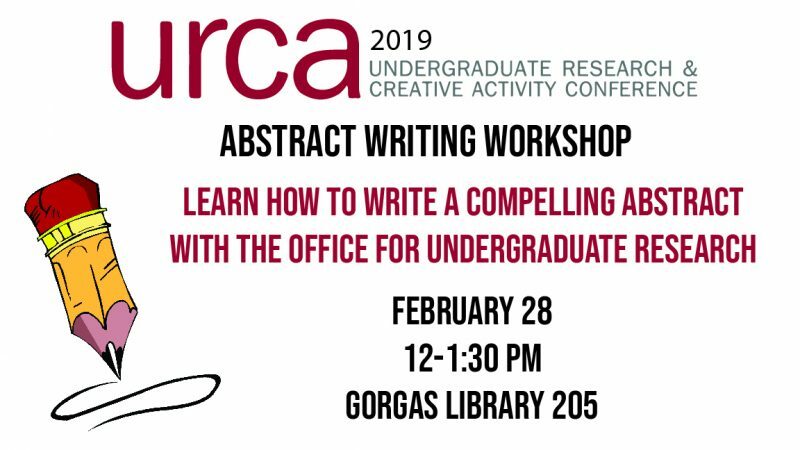 Join the Office for Undergraduate Research for a Presentation Workshop in Gorgas Library 205 from 12-1:30 p.m. on Thursday February 29th! Take this opportunity to practice and get pointers on your presentation before the Undergraduate Research and Creative Activities Conference! Free foods and drinks will be provided. 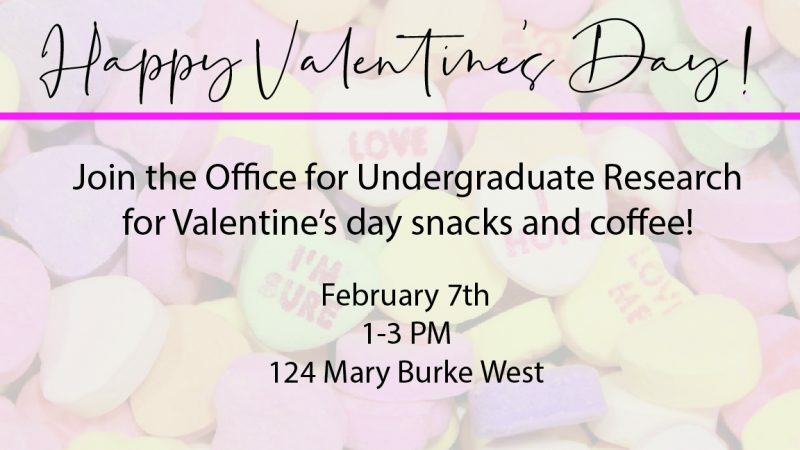 Please join us at the Undergraduate Research Resource Center in Mary Burke West room 124 for coffee, Valentine’s treats and a meet-and-greet with The Office of Undergraduate Research from 1-3pm Thursday, February 7th. Ambassadors, student workers, and personnel will be available for any questions regarding Emerging Scholars Program and The Undergraduate Research and Creative Activity Conference (URCA). 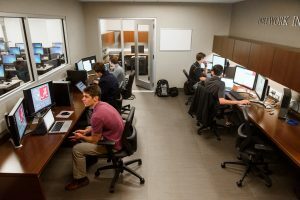 The Office of Information Technology works to block dark web traffic from entering UA, but for five students in Cyber Hall, the dark web serves as a place of employment. The Network Intrusion Lab, located in Cyber Hall, houses faculty and student researchers building mechanisms to monitor and analyze dark web network traffic. According to UA OIT, the dark web is a part of the internet that is only accessible by means of special software that allows users to remain anonymous to conduct mostly malicious activity. The NIL opened in January 2017 and is a joint project through the continued partnership between UAPD and the College of Arts and Sciences. The Office of Information Technology provides the NIL a secure research environment where students can work with faculty to build network analysis tools. Dr. Diana Dolliver works with Austin Rife in the NIL. The NIL strives to increase awareness and knowledge about cyber activity, particularly with law enforcement. The NIL is a function of the Joint Electronic Crimes Task Force. Established in August 2014, the JECTF assists local and national law enforcement officials with processing digital evidence for use in cybercrime prosecutions. The students in the NIL work not only to monitor network activity, but also to provide necessary information to local and federal law enforcement to prevent malicious activity and to help solve criminal cases. “We take this data, and we determine how much of a negative impact it can have to society, and we share it with the proper audiences and law enforcement,” said Fuhriman. The students working in the NIL bring a variety of experience and diverse majors of study to the group. The research being conducted at the NIL is the first of its kind. Fewer than 10 academic institutions across the United States have a digital forensics task force, and the UA NIL, as a part of such task force, is the first of its kind. NIL internships are available to students in all majors of study. Undergraduate and graduate students can now apply for internships at the NIL at cybercrime.as.ua.edu. Undergraduate Research Resource Center: We’ve Moved! The Undergraduate Research Resource Center is open to provide in-person assistance regarding the Emerging Scholars Program and to ask questions about the Office of Undergraduate Research.